November 28th 2008, 4 years ago, I left NJ. Drove with no direction other then warm and west, with a new MacBook and camera and no clue what to do. 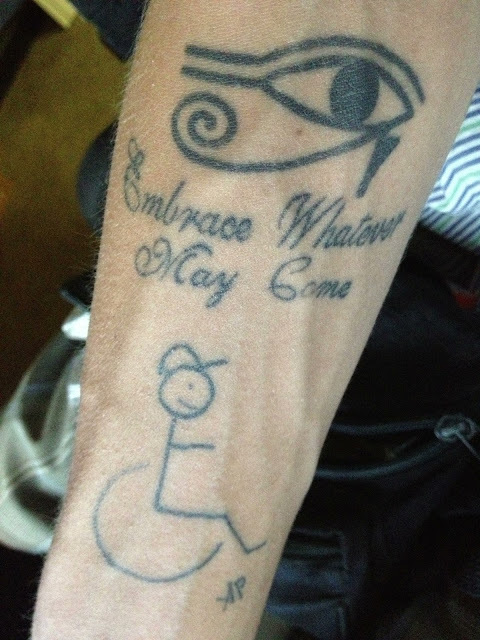 Today I celebrate 4 years of living the "impossible" life of a disabled man living alone in LA. To all the people who had no faith in me, and ditched me as a friend, said cruel things to me..... NANY NANY POO POO!!!! Haha I DID IT, I SURVIVED, I DROVE EVERY MILE 3 times cross country, changed a law in NJ, battled starvation, spoke at schools, countless newspapers and interviews, no help, often no bathroom.....(yeah...ya get creative hah), falling out of my chair countless times, almost died countless times. IT'S BEEN A BUMPY BEAUTIFUL ROAD AND STILL IS!!! LOL And I'm here telling you it was all worth it. Realizing your dream is the best feeling in the world, add being someone people look up to.... I have the greatest life of any man on earth. Just thinking of all the things that has happened brings tears to my eyes it's so beautiful to me. I just love the universe, I love life and I love all of you. Haters, lovers, friends, family, I love you.